Style matters. Let’s not pretend otherwise. If we didn’t care about it… well… there wouldn’t be hundreds of different motorcycles for us to choose from. 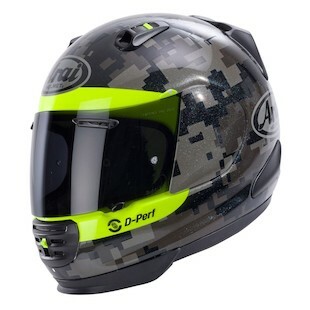 Looking at the new line of Defiant Pro-Cruise graphics, Arai has really upped its game in the pursuit of style. In my eyes, the new Arai Defiant Pro-Cruise Mimetic Helmet is one of the coolest graphics to hit the market in a long time. Designed specifically for riders on naked bikes looking for the functionality of a built-in sun shade/sun visor, which is afforded by the pre-installed Pro Shade system, this helmet provides style and function unlike any other. The Hi-Viz markings set against the urban camo paint scheme give this one of the most unique looks of anything on the market. With all of the functional aspects of the original Defiant, such as specialized lower chin spoiler and SAI Max Vision Pinlock Shield, the Pro-Cruise also comes with an advanced Eco-Pure liner and upgraded ear pockets, for better fitment of communication system speakers. Leaving nothing to chance with the name, the new Arai Defiant Pro-Cruise Bold Helmet lets everyone know where it stands. 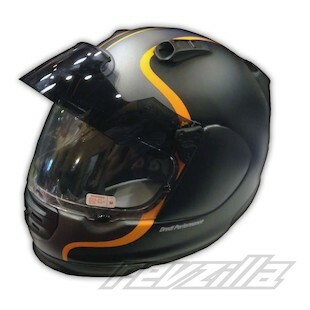 Simple in styling, but efficient in its message, the orange-on-black color scheme speaks to the RevZillian in us all! With all of the same features as the Defiant Pro-Cruise, the Pro-Cruise Bold Helmet is for riders who are not looking for loud, over-the-top vibrancy, yet still want to break away from a solid-color lid. The new Arai Defiant Pro-Cruise Helmet offers some seriously intriguing advancements in its design. Functionality abounds through a wide variety of new features. If you are looking to procure such a helmet, yet want something a little louder, then the Pro-Cruise Mimetic and Pro-Cruise Bold are great places to start your search.